Alright – it’s late-January and I’m confident you are well into your own 2018 routines and eating habits (or not). One of the goals we have in our household is more meal-prep which means more time in the kitchen. As a busy business owner with little spare time to cook, the convenience of our kitchen needs will come first when beginning our kitchen renovation design. 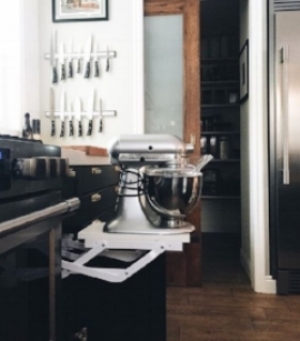 I’ve done some research and here are some kitchen accessory must-haves for our kitchen. Although fairly new to the Kitchen-Aid mixer club, it’s currently taking up a massive amount of space on my already small countertop. I’ve contemplated between a garage cabinet or a pull-up storage stand, but ultimately don’t want to ever lift or scoot the heavy piece again. If you’re anything like us, we recycle far more than we toss, which means we need side-by-side trash/recycle bins and a place for bags! This is the perfect solution instead of bending down underneath the sink or hassling the stairs for trash and recycle bags! 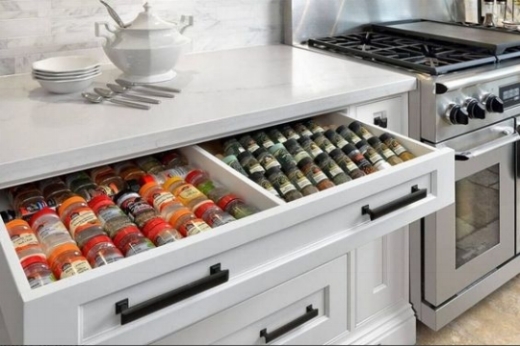 I’m a fan of drawers over doors, so I love how this spice drawer is easily accessible AND has a division for those two sets of spices we all have (generic and name brand)! What would I add? Another division on the right or left to store my two sets of measuring spoons (decorative and functional, of course! ), making that portion of meal prep a breeze. Who else is a dog lover out there?! 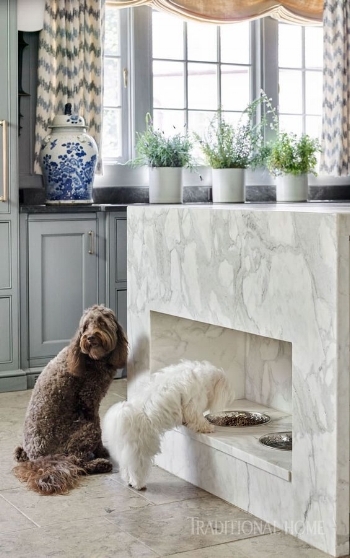 We are a dog family and likely always will be, so having a place in the kitchen for our dog to eat and drink water is important. Although not a kitchen accessory, per say, this feeding station is convenient, stunning and easy to clean! Any #teamcat readers? A smaller version of this example would also work! Now that the Kitchen-Aid mixer is taken care of, what about your Vitamix, food processor, toaster, coffee maker, etc.?! Enter an appliance garage. These days, there are many unique garage doors, hinges and cabinet fronts to explore when considering an appliance garage. The example below takes advantage of what would have been an awkward corner and turns the space into functional and hidden! Which is your favorite kitchen accessory? Comment below! This blog post is in collaboration with ACo - Love Where You Live. Courtney here with our first (of hopefully many) blog posts for the 2017 year. Recently I had a design/wakeup crisis with my to-be Mr. and immediately messaged Christina expaining this experience was one for the blog. Do any of you readers go to bed scrolling through your phone and wake up to the same? Yeah, us too. The phone holds (basically) our lives on it, including the functionality of an alarm. Most recently, our two little digital devices both failed us - going from 42% to dead as a door nail in the middle of the night. Cool on the weekend - not so much when I have a 7.30 AM meeting. Decision made the second my eyes opened in panic - we are getting a clock that plugs in OR has batteries - a good 'ole fashioned alarm clock! It was pure disappointment at Target that evening when I walk up to options of alarms. There were five - one without Disney characters on it. Super! So I purchased the one, but it has yet to be taken out of the bag and fully intend to return. Before some research, I was holding on to hope someone still made stylish, yet functional alarm clocks. Alas, I found some options for all design styles.. Although the Wake-Up-Light is intriguing, we may go with the Transitional styled alarm clock for our room! Is anyone else in the market? Which will you choose?